Address: Avenida Faro de Pechiguera, s/n, Playa Blanca (Lanzarote), Islas Canarias. This complex is situated In the south of Lanzarote, near the protected Los Ajaches Natural Reserve and with views of Lobos and Fuertaventura islands. 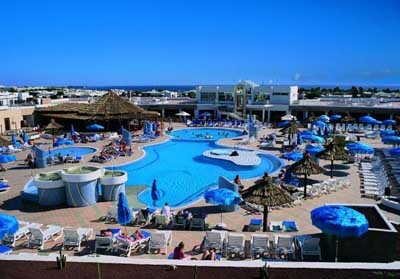 Relax next to the swimming pool on the sun terraces of the complex, in the hot Lanzarote sunshine. Alternatively, you can take a short drive to the stunning Papagayo beaches that are located near the hotel and enjoy the pleasant natural setting. If you enjoy outdoor activities, Timafaya National Park is a short distance away from the hotel. Guests are offered to enjoy the paying water park, located on a sister hotel. The property offers free daily shuttles to the water park. Playa Blanca is the perfect place to get away from it all and enjoy the welcoming, family atmosphere of the complex. Guests are required to show a photo identification and credit card upon check-in. Please note that all Special Requests are subject to availability and additional charges may apply. Please note the property considers children guests up to 13 years old.